Named after one of the most famous regions in Ireland, Connemara is one of natures masterpieces. The rugged Atlantic coastline and majestic mountains blend with the rain-soaked peated bog lands to create a landscape of unique natural beauty. 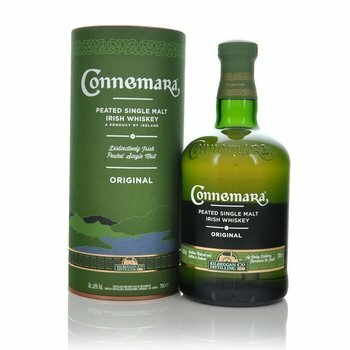 Connemara Peated Single Malt Irish Whiskey captures the beauty of this region while reviving its traditions. This rare and original find among Irish whiskeys is a single malt, beautifully gilded in peat reek. Managing Director of Cooley Distillery, David Hynes and chairman John Teeling resurrected the traditional Irish custom of drying the malted barley over peat fires with this peated single malt. The smoke rising through the malted barley during this drying process confers the whiskey with a distinct peaty flavour and aroma. These traditional distilling methods combined with natural ingredients and long years in oak casks continue to create a whiskey that is simply exceptional! 10:10 Uniquely west of Ireland taste owing the malted barley being roasted over the turf that comes out of the peat bogs in Ireland. I love when friends of mine travelling bring me a present of a bottle of this wonderful Irish made Whiskey. The bottle is a lovely Irish touch with the presentation box reminisant of the West of Ireland and the Connemara landscape.